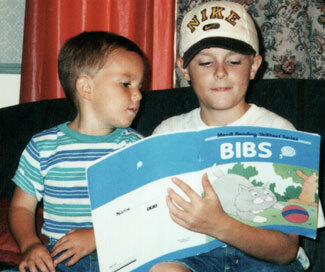 Kenny, age 8, teaching Jason, age 3, to read. I was born to two dedicated parents whose care exceeded just addressing the needs of the present. Perhaps it was the hopelessness that theses loving parents felt that prompted care like this. After all, these parents also had a severely brain injured son named Evan. They had to look forward to the future, because focusing on what was lacking in the present was just too unbearable. So, rather than just focusing on the immediate needs of the day, these parents learned to look forward to what their sons’ would become, and they went to great lengths to make those plans a reality. This is why my parents chose a path for me full of hope: a path also known as the National Association for Child Development. My journey along this path began in 1993, at the age of three, almost four years old. Even at this young age I still vaguely remember my first trip to an NACD evaluation site. My older brother Philip and I remained in the waiting room as my mom took Evan into another room. Every once and while my mom would poke her head out and ask if we were behaving, then she would return to the room where something was happening with Evan. After a while she emerged, carrying Evan, subtle signs of tears still on her face, with a large man in reading glasses following them. The large man with the reading glasses walked over to Philip and me, bent down so he was eye level with us, peered over the glasses, and said, “We are going to help your brother and so are you.” I remember thinking hard about this statement. What did he mean he was going to help my brother? What was wrong with my brother? What was he going to do to him? And above all, how was I supposed to help? This was to be the first of many thought provoking experiences involving NACD. From here we jump ahead a few years to a time when I was old enough to be aware of the path I was on. Every morning I would wake up and get breakfast after which would be my time to work with my brother Evan, as my mom would be working with Philip. When the time came my mom would give me my assignments or list of exercises for the day, and then she would do a unit study with the three of us. After that she would work with Evan alone. During the day she would have us compete with digit spans, and there was a special song that we all sang when Evan would do well. After our data sheets were filled with check marks, it was time for her to do her volunteer work with NACD. Then once a month or so we would all travel to a church in a suburb of Dallas where my mom would do the program teaching for either Bob Doman or another of his evaluators. It is here that I discovered what exactly it was that we did. All of these games my mother had been playing with us were really activities, a form of home schooling. My mom was always really good about sneaking activities in without me being aware I was doing program. When most families play the license plate game on long car rides mine played Spell, Repeat and Identify and listened to books on tape. As time progressed our family got bigger and two babies a few years apart were added to my Mom’s 15-minute schedule that she had mapped out for all of us. There was always something to learn, or a sibling to be doing something with. I began to make friends with the kids who came to be evaluated. I remember the Sheltons who had a daughter with cerebral palsy. They too had a large family that was all on program and a mom that volunteered for NACD. I remember meeting John Michel and Gabriel Fry, two gentle giants whose own magnificent parents later adopted another special needs child from Russia. These are the kind of people that I would meet; families that I thought of as pioneers of the NACD lifestyle. These families realized that the program held so much hope for their children that they wanted to spread this hope, and before long the word of mouth spread and more and more families were coming. Over the years I would watch these kids come through the doors, and I would sit and play with them as they waited to be seen by their evaluator. It was also around this time that I began going with my mom to the home school book fairs she attended. I would sit and watch as droves of mothers and fathers would come up to our booth after my mom had spoken at a seminar. All these caring and loving parents said the exact same thing: “This is what we have been hoping and praying to find.” Soon I too would take on the inevitable enthusiasm for NACD. At the age of 8 I started going over to another NACD kid’s house to help his mom with his program. In reality I was just there to teach him how to climb trees, rollerblade, and throw a baseball. The only difference was I did it with an NACD flair. The label he had been given was “Autistic Spectrum.” To me this only meant that he was just a little broken and needed help getting fixed. The hardest thing I ever had to do when working/playing with him was to get him to stop stimming long enough to throw the ball back to me. Getting him to catch the ball when I threw it to him was never hard because it is really hard to stim when a baseball is flying at you. In my own school work I was always very independent. This is most likely because my mother had worked on getting my processing up early. From the time I learned to read there was no stopping me. Unless I was practicing baseball or doing program with Evan, I was reading. There is no limit to what a person can learn if they can read and comprehend what they are reading. My mom never used packaged curriculum, she just gave us our foundation and a love to learn. My granddad, a chemistry teacher, gave me some of his chemistry text books when I was about 11, and I found a real niche for myself; a field where you could do math and study science at the same time. At 14 I went into the local public high school on their ‘Distinguished Achievement Plan,’ which really meant I would get to have the good teachers. These teachers challenged me to use the knowledge I had learned in reading. I competed in academics and had a state ranking score on the Science UIL test. Perhaps this is the reason that my chemistry teacher recommended me for a position working in a lab at a chemical company. 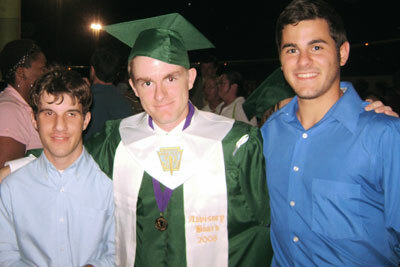 Evan, 19, Philip, 19, and Kenny, 18. Often I have listened to others talk about the challenges of having a son or daughter with special needs and the challenge of meeting the needs of all their children. Overcoming those obstacles only requires passion, drive, and the love that inspired those first two virtues. It is the overcoming of these obstacles that builds the platform for success. We never really sat and thought about it a lot; we just took the guidance that we were given and went to work with a smile to make it fun. Soon obstacles were falling by the wayside. So where has this NACD path taken me and what part has it played in my life today? I think that one of the most important aspects of the contributions that NACD has played in my life is the mindset that nothing is impossible, or at least you will not know what IS possible unless you give it a well planned, all out attempt to conquer and prevail. I have seen and been a part of the one brother overcoming brain injury and another one who struggled with learning difficulties. I have been in the waiting room and watched as kids on NACD TDI programs rid themselves of label after label and were transformed into new and improved versions of great individuals. I have watched Bob, my mom, and other staff members step back and thoroughly analyze what they are doing. If it isn’t working well enough they contemplate how they can change it so that it does. Because my mom spent time getting my processing up, I was able to teach myself a good part of chemistry before I went into High School, which led to my High School Chemistry teacher recommending me for a job that places me years beyond the career path of my peers. In essence, Tennyson sums it up best: “I am a part of all that I have met.” Hopefully one day I will be able to use the knowledge I have gained to give back to those who have taught me such great life lessons.